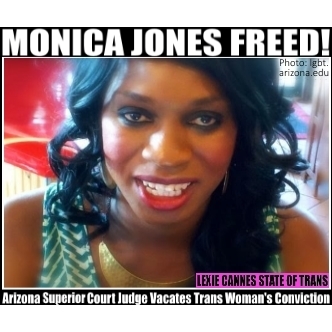 LEXIE CANNES STATE OF TRANS — Finding that trans woman Monica Jones was denied a fair trial, Arizona Superior Court Judge Crane McClennen vacated a 2014 conviction by a lower court. The Jones’ case united the trans community who believed she suffered a miscarriage of justice when she was subject to police anti-trans profiling and later found guilty of “intent to commit prostitution.” Advocates argued a Phoenix law unfairly targeted trans women, especially trans women of color. Advocates also approached Attorney General Eric Holder about the profiling matter. McClennen sent the case back to lower court. A retrial is possible. As research statistics show, trans women of color find themselves at a significant disadvantage in our society. It is unfair to set legal traps to trip them up when it was society that put them at a disadvantage in the first place.